By the time Henry Foster was 3 years old, he had had a dozen surgeries and procedures, had dozens of diagnostic exams, seen over a dozen specialists, and had had hundreds of doctor and physical therapy appointments. Initially diagnosed with failure to thrive, Henry battled dozens of infections, respiratory problems, and visions problems. He could not crawl or walk until he was 2 years old. He had to have a feeding tube placed in his stomach when he was unable to eat. After years of searching, worrying, and not knowing what was wrong with their child, the Foster family finally had an answer to Henry’s problems – he has mitochondrial disease. His cells do not have enough energy for his body to properly function. It is neuro-degenerative and progressive illness. As Henry ages, his energy level will drop until there is not enough energy to sustain life. Unless there are significant medical advances, Henry will die of this disease. Despite the fact that Henry is often feels weak or sick, he is always resilient, happy, and courageous. He has never complained about constantly needing medical treatment. 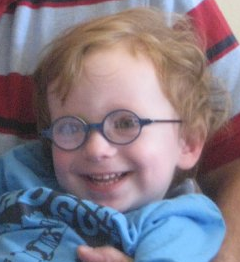 His parents created Henry’s Hope in 2010 in honor of children like Henry and their families. The purpose of Henry’s Hope is to give “all children with life-threatening medical conditions have access to medical treatment, supplies, and support for their families – regardless of socio-economic status.” The Fosters have seen firsthand that many families cannot afford the medical treatment necessary to arrive at a diagnosis for their children’s illnesses or the special food and medication required for them to survive. Instead of focusing only on their child, they have created this organization to help other families that are not as fortunate as them. Beyond helping families receive proper treatment, the organization is dedicated to provide advocates for families, to help them navigate insurance companies and government entities. They also provide advocates that help these families understand the physical and emotional aspects of having a child with a life-threatening illness. Henry’s Hope is dedicated to bringing attention to children with terminal and life-threatening illnesses and the lack of funding for research. Henry’s Hope raises money to support research facilities that are working on more effective treatments and cures for these illnesses. Henry’s Hope is an organization dedicated to easing the suffering of these children – some of who are fighting for their lives, and to helping their families have the medical and emotional support they need. Amazingly, this organization relies completely on donations and volunteers. Please donate whatever you have – whether it is money or time – to help Henry’s Hope. You can also keep up with Henry’s Hope on Facebook and Twitter. Sponsor A Law Kid is my endeavor to pay for my last semester of law school. Today’s sponsor is Henry’s Hope. For more information about Sponsor A Law Kid or to see what days are still available for sponsorship, visit my Sponsor A Law Kid page. Posted in: Sponsor A Law Kid.